Risk Management in the Hospitality Industry - Scarsdale Premier Insurance Agency | Advocate Brokerage Corp. There are risks in any industry. 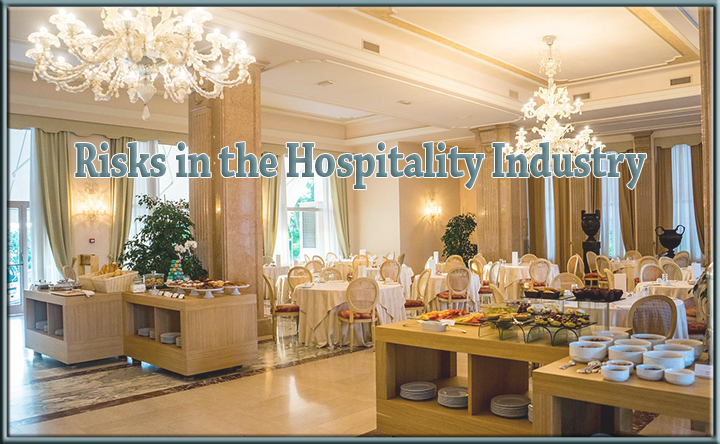 One of the industries that face a large amount of risk is the hospitality industry. Managing these risks is crucial to making sure your hospitality based business will run smoothly. This blog lists some of the major risks facing the hospitality industry and some Advocate Tips on how to limit your exposure. Businesses in the hospitality industry face a large level of property risk. There are multiple ignition sources in hotels and restaurants. Not to mention the fact that much of the contents are highly combustible. To reduce this risk, ensure that all smoke and fire alarm systems are functioning and meet National Fire Prevention Association (NFPA) requirements. Advocate Tip –Be sure your coverage includes a replacement cost valuation and make sure the coverage limits are regularly reviewed for adequacy. If your building and contents are damaged, a policy that is lacking adequate coverage faces a catastrophic loss. With enough coverage and replacement cost valuation, you should be able to rebuild and replace the building and contents. The risk of injury on premises is very high in the hospitality industry. Due to the high number of guests that go through your doors each day, it is essential to minimize this exposure by taking certain precautions. 1. It is essential to implement safety codes in hazardous areas such as stairways, elevators, railings, and floor coverings. 2. Make sure that all exits are clearly marked. 3. Be sure to have back up lighting systems in place in the event of power outages. Many businesses within the hospitality industry sell alcohol. You could be held liable if someone becomes overly intoxicated and gets into an altercation or a car accident upon leaving your establishment. Advocate Tip –When it comes to alcohol, employees who are serving alcohol should be trained to know when a customer has consumed too much alcohol to prevent excessive drinking. If your hotel or restaurant has a valet service, you increase your exposure to automotive liability. The risk becomes even higher if you offer transportation services to and from airports or other venues. Advocate Tip–To lower the risk of Automotive Liability, restrict driving to qualified employees. If you are hiring for a position that includes these types of responsibilities be sure to review their Motor Vehicle Records as part of the interview process. Many automotive services can be outsourced. When outsourcing, be sure to have a contractual transfer of risk to the independent contractor providing the services for you. Would you be surprised to learn that the hospitality industry was the most breached sector for credit card data theft in 2009? With a majority of customers utilizing credit cards to pay for products or services, the risk of exposure is very high. Whether it is a customer paying with a credit card, maintaining a database that includes personal information for a loyalty club, or booking a reservation with a credit card number, there are many opportunities for a data breach to occur. 1. Lower your risk by staying on top of security protocols and keeping your systems up to date. 2. Be consistent with employee training so they can help detect fraudulent credit card use. 3. Be sure you have some type insurance in place that covers both first and third party such as Cyber Liability or Data Breach coverage. Occurring naturally in the environment, legionella can sometimes be found in portable water systems. It can also enter a plumbing system during construction or repair. Additionally, any mist that is produced by legionella contaminated water or ice can be aspirated into the lungs by susceptible individuals. In the hospitality industry, shower heads, decorative fountains, spas, faucet aerators and cooling towers all become a source for potential exposure. Advocate Tips – Consult with indoor air quality professionals to develop best practices and procedures that help to control the presence of Legionella and protect the health of your guests. Advocate Brokerage works with a number of businesses in the hospitality industry. We have both extensive experience and knowledge of the industry and thus understand the type of risks unique to hotels and other hospitality related businesses. We would love the opportunity to review your current coverage and find out if there are potential gaps in the coverage you already have in place. Please give us a call, for a review or to ask any questions you may have about your current coverage.